Ricochet has been balancing boards… and lives for the last 10 years! Ricochet pioneered the concept of kids surfing with dogs as a form of assistance, healing, therapy and empowerment when, on August 20th, 2009, she made an independent decision, to jump on Ivison's board. Something like that had never happened before, and history was made, so was a video that went viral. It comes with a “Kleenex alert” warning and has more than 12 million views on Facebook and YouTube, which can be viewed at this link https://youtu.be/BGODurRfVv4. Since that day in 2009, Ricochet has surfed with hundreds of kids with special needs, people with disabilities, wounded warriors and veterans with PTSD. She's affiliated with scores of organizations, raised more than ½ million dollars for over 250 human & animal causes, published a book, was cast for an IMAX movie called Superpower Dogs premiering in March of 2019 and much, much more. She continually adds to her global ruff'sume in credentials, size, scale, and depth of programs. She is a registered and certified goal directed therapy dog, and holds the highest AKC title of Therapy Dog Distinguished. 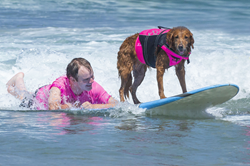 She went from service dog to SURFice dog® and provides the means to empower, enhance and improve the quality of life for individuals with physical, cognitive or emotional disabilities. Ricochet's efforts have resulted in many awards and accolades including ASPCA Dog of the Year, American Humane Association Hero Dog Award, AKC's Award for Canine Excellence, and an induction to the California Veterinary Medical Association's Animal Hall of Fame. She is one of the original southern California surfing dogs that started on the competition circuit. She typically won first, second or third place until she stopped competing to focus exclusively on her canine assisted surfing. Despite ceasing the competitive aspect of her surf dog career, she was inducted into the International Surf Dog Walk of Fame and Helen Woodward's Surf Dog Hall of Fame. Although surfing has been at the forefront of Ricochet's work, it's not the act of surfing that makes her interactions with people so life changing. “For the past decade, Ricochet has balanced boards… and lives. She's offered individuals something no one else could – her incredible gift of healing, no matter the person's challenge, disability or angst,” said Judy Fridono, Ricochet's guardian. “As I look ahead, I see her legacy as one that continues through every dog on this planet. I have learned an exponential amount about the healing power of dogs through Ricochet, and it's my privilege to share it with other dog owners so they can unleash their dog's healing power too.” For more information, visit https://www.surfdogricochet.com/healing-power-of-dogs.html. Please visit Ricochet's website https://www.surfdogricochet.com and follow her on social media @SurfDogRicochet.